Our month of guest blog posts continues! All opinions expressed in our guest posts are those of the author and not necessarily those of Seattle Opera. Please welcome Christopher Budd and read on! On Sunday August 9, the Seattle Opera kicked off the first cycle of their 2009 Ring Cycle with Das Rheingold. With Wednesday’s night performance of Siegfried we’re three-quarters of the way through the cycle. Wednesday also marks the last appearance of Greer Grimsley as Wotan in this cycle (with the possible exception of a non-speaking, non-singing cameo at the end of Götterdämmerung on Friday). I will freely admit: Wotan is my favorite character in the work. And so, after Siegfried, I’m looking back specifically on Grimsley’s portrayal of Wotan in this cycle. As I think about Grimsley’s Wotan, I find that he’s shown me a new and different Wotan than I’ve seen before. This in turn has helped me to see how this cycle, the third staged by Stephen Wadsworth, shows that the staging truly is hitting its stride and moving from simply being a portrayal of Wagner’s work to a true exploration of the work and its meanings. I’ve been fortunate enough to have seen the other two Wadsworth stagings in 2001 and 2005. I felt that while the first one in 2001 was good, it did feel like everyone was still getting the hang of that staging. The second staging in 2005 showed a greater comfort and familiarity. Taken together, the differences between 2001 and 2005 are like the difference between season 1 and season 2 of a good TV show: the first is setting the stage and the second is starting to really explore that stage. But in both cases, everyone is still focused on the staging and not yet able to go inward and explore what they can create themselves within that staging. With this year’s cycle, the analogy continues to be apt. This year feels like season 3 of a TV show: Now they can go inward and explore what they can create and, in so doing, find new depths and nuances and deliver a cycle that truly illuminates new things about the work. I saw this most clearly in relation to Wotan, both in terms of how Greer Grimsley has portrayed him this time and in terms of how other major characters interact with him. With this year’s cycle, we see a new Wotan; one that is still cagey, strong, and commanding but also more loving, expressive, affectionate and, dare I say, human in his interactions with others. I noticed the first instance of this more human tenderness in the exchanges between Wotan and Fricka early in scene 2 of Das Rheingold. Here, there is a truer sense of deep, albeit complicated love and affection between the two of them. 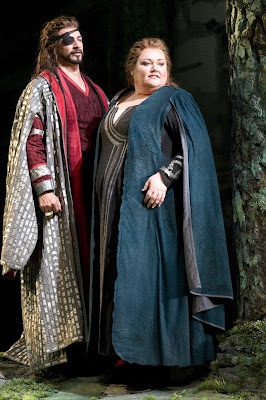 Stephanie Blythe, who has owned the role of Fricka in every Seattle Ring production since 2000, conveys a love for Wotan that is true, though complicated by his inabil ity to meet all of her needs, most notably his continued wanderings and affairs. And Grimsley responds in kind, delivering a Wotan who responds to Fricka not simply as an aggrieved and put-upon husband but who also loves her, even though that love is complicated for him by her inability to accept him for who and what he truly is. Even where there is contention between the two characters, they touch, embrace and even kiss more than I’ve seen in other productions. 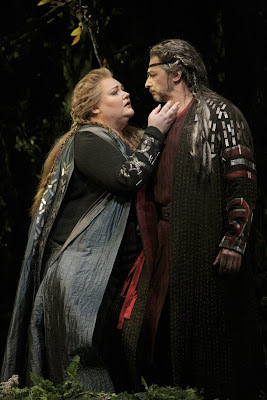 This love between Wotan and Fricka can even be seen in the most contentious of scenes between the two characters, Act II of Die Walküre, when Fricka demands that Wotan abandon Siegmund as a point of her honor. 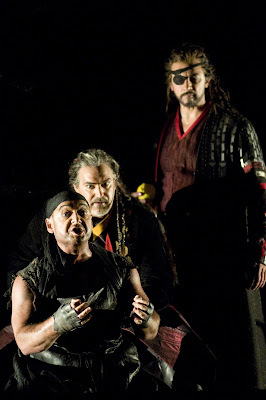 Grimsley and Blythe together manage to deliver an intensely complex, nuanced scene that by turns shows the love between Fricka and Wotan, their frustration with the other’s inability to understand and meet their needs, Wotan’s love of Siegmund, and Wotan’s frustration from his will being thwarted. Their poses of physical stand-offishness at the beginning of the scene give way at the end to physical affection between the two. However, it’s an affection colored by the fatigue of argument and the resignation borne of Wotan’s realization that Fricka’s points about Siegmund not being truly free are valid and represent a major flaw in his sche me. Unlike other portrayals of this scene as a simple clash of wills with Wotan yielding to the brute force battering of Fricka’s will, this scene shows true give and take, loss and regret. The complexity of Fricka and Wotan’s relationship in this Cycle shows itself too in their relationships with Loge in Das Rheingold. In this particular cycle, Loge and Wotan show their own (somewhat at least) warm bond of friendship. In scene III in Nibelheim, there’s an easy give and take between the two characters that culminate in a wonderfully funny homage to the Three Stooges with them throwing Alberich, in frog form, back and forth. The chumminess shown in the “Wotan and Loge show” is present throughout Das Rheingold and gives these two a different, closer relationship than I’ve seen in previous stagings. But as is often the case when a husband has a close male friend, it has an impact on the dynamics of the marriage. That Fricka dislikes and distrusts Loge, viewing him almost as a bad influence, is a common element in stagings that I’ve seen. Here, however, you get a new, different sense to the relationship between Loge and Fricka at the end of Das Rheingold. First, you get a stronger sense that the feeling is mutual: that Loge dislikes Fricka, perhaps seeing her as an obstacle to his relationship with Wotan. Second, at the very close of Das Rheingold, as the gods make their way to the newly finished Valhalla, Fricka and Loge stay behind sharing a long, wordless, songless scene that conveyed a certain sense of détente between them. I had a sense that they don’t like each other but because of the closeness of each of them to Wotan, they’re at least trying to find a way to get on. That struck me as a uniquely human rather than divine aspect of relationships. Interestingly, Grimsley’s Wotan manages to show love and affection to Fricka through the Cycle while also showing a genuine, passionate, romantic connection with Erda in both Das Rheingold and Siegfried. In scene IV of Das Rheingold when Erda rises to warn Wotan of the dangers of the ring and urges him to abandon it and give it to the giants, the exchange between them is truly intimate, with each often just inches away from each other often touching, holding or even caressing one another. When Wotan says at the end the he must find her, we know that it’s not simply for her wisdom: this is a god that has experienced love at first sight and is compelled to follow that love. 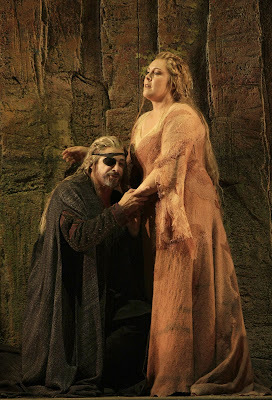 That we should later see Wotan showing love and affection with Fricka in Die Walküre, after this scene, shows us another complexity about Wotan as a character: his wanderings and affairs don’t necessarily mean that his love for Fricka is gone. In Die Walküre, he tells of how he gave his eye so that he could wed Fricka and it’s clear in the delivery that the love that drove that act is still there for him. One gets a sense in this exchange that one of the points of frustration for Wotan is that Fricka can’t understand that both his need to wander and his love for Fricka can coexist simultaneously. He fathered the Valkyries with Erda, but he still loves Fricka and has come back to her. And the relationship with Erda isn’t a simple affair that is over and done with. In one of Wotan’s last scenes, in Act III of Siegfried when he calls Erda back from her sleep, the exchange is at least as physically intimate, passionate, and affectionate as their exchange in Das Rheingold. But here it’s been deepened by their shared love for their children, most especially Brünnhilde. 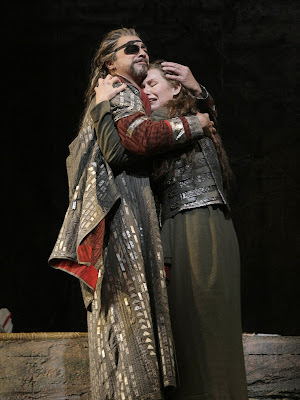 As Wotan bids Erda a final farewell, it’s clear that not only was he in love with her, he loves her. His parting from her is painful for him but it’s clear too that he wants her to be at peace. In any staging of the Ring, it is in Wotan’s parting from Brünnhilde where we most clearly and visibly see love in Wotan. The poignancy with which the pain of their separation is conveyed makes this scene a favorite in any staging. And on Monday when I was sitting watching as Wotan and Brünnhilde embrace for the last time, as the music reached a crescendo, I was immediately surrounded by a chorus of muffled sniffles, and much wiping of the eyes. As one would expect, this staging did show more depth and human emotion in their parting. But perhaps the way in which this staging was most striking and showed a depth and vulnerability in Wotan beyond those I’ve seen in other stagings is at the very end, as Wotan leaves the now-sleeping Brünnhilde. As Grimsley’s Wotan leaves Brünnhilde, he shuffles, hunched over, bent by the overwhelming weight of grief and loss. And as he’s shuffling away, he stumbles, catching and bracing himself on the rock. He stumbles once, twice. And as he starts to round the rock to leave us, he stumbles a third time. But this time he fails to catch himself and crumples to the ground. And as the music fad es, the lights darken and the curtain begins to fall, we see the silhouette of a crumpled Wotan illuminated by the flickering firelight. Put simply, I’ve never seen a portrayal of Wotan that conveys so eloquently a physically crushing sense of grief and loss at the end of Die Walküre. The Wotan on the ground at the close looks less like a god and more like a human being, with the full range and depth of emotions. My first Wotan was James Morris in San Francisco in 1999. And with all due respect to Phillip Joll in 2001 and even Grimsley in 2005, Morris rather set himself up as the archetype of Wotan for me then. I liked both Joll’s and Grimsley’s performances but I have to be honest and say I was looking at them in terms of Morris’s interpretation. 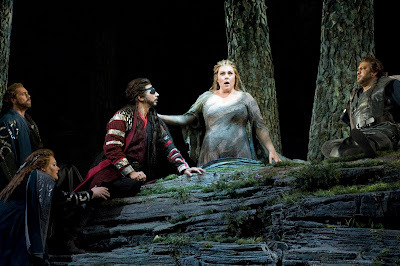 But with the 2009 Cycle, I found the Grimsley Wotan bringing out new nuanced qualities that I’ve never seen before. With this cycle, the Wotan that Grimsley portrayed, along with the rest of the cast’s interactions, is a new Wotan that speaks more directly to me even than the 1999 Morris Wotan. The opera experience is an ephemeral one. It’s a convergence of specific singers, musicians, production staff and audience members at a particular point in time for only a short period. Because of that, I may never again have an experience of Wotan quite like what I have these past three nights. But that I’ve had this experience at all is a truly wonderful thing that I’ll carry with me for the rest of my life. And I’m truly grateful to everyone that came together those three nights to make it all happen. Christopher Budd and his wife are season ticket holders at Seattle Opera for a number of years. He is a long-time Wagner fan and has an amateur background in music, history, music history, mythology, and philosophy. He maintains a music blog at http://andante.squarespace.com/ and you can follow him on Twitter at http://www.twitter.com/christopherbudd. I think kids should study Wagner's "Ring" the way they study Shakespeare. These operas can teach us so much about life! What a hopelessly bourgeois interpretation--Wotan as a middle-aged executive or upper-middle-class professional. Sympathize all you want with the power-hungry, law-making Wotan. But the highest expression of wisdom/understanding/consciousness in the Ring occurs when Brunnhilde understands that Valhalla and the death of Siegfried (i.e. nature) are coterminous, and resolves to sacrifice herself to destroy Valhalla and the gods. That is beyond bourgeois understanding.